Stains and algae cannot cling to the Ultraguard Super Epoxy swimming pool resurfacing system. You will save hundreds of dollars every year on chemicals because you will not have to try to kill and get rid of algae. Ultraguard Super Epoxy with a swimming pool restoration you will never again have scraped knees, elbows or cut feet. Our tile-like finish is smooth and non-porous so that acid washing is never necessary. With a Ultraguard Super Epoxy swimming pool resurfacing, a sponge and mild detergent will remove most stains and algae because Ultraguard Super Epoxy does not become a host. Aging plaster becomes rough, allowing algae and stains to grab hold. Acid washing is a temporary solution. Unfortunately, acid washing causes additional degradation, where the surface becomes so rough it can actually cut swimmer’s feet. 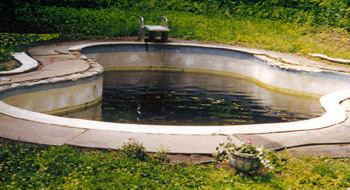 RESTORE YOUR OWN POOL INTERIOR BETTER THAN ANY SWIMMING POOL RESTORATION COMPANY AND SAVE MONEY! Best of all you get the best Warranty in the Business!